You can create a beautiful updo in Marlton for your wedding. Watch this video to find out how. The video explains that, for the best results, you should divide the hair into as few and as large sections as possible. The presenter demonstrates how to curl sections of hair using a curling iron and then pin them back against the head while you work on the rest of the hairstyle. She shows how to use backcombing to create height at the crown. The video reminds us to check the hairstyle as we go along, to make sure it is balanced and symmetrical. It then discusses how to create height at the crown. The video recommends curling hair close to the root, for better texture and more volume. The video demonstrates how to pin the hair in order to create a beautiful mass of curls at the back of the head. Finally, the video recommends a curly hairstyle for your wedding if you have naturally curly hair. It will make you feel like a more beautiful version of your everyday self. Many people find it difficult to communicate clearly with their hair stylist. If you fail to describe your wishes clearly, you could end up with a hairstyle you were not expecting or did not want. It’s vital to learn how to tell your hairdresser exactly how you would like your hair to look. 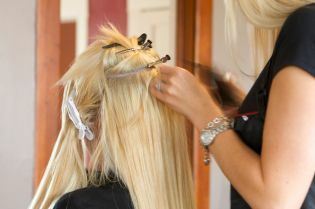 Here are a few tips for you if you are about to visit a hair salon in Marlton . By using the right terminology, you can ensure that your hairstylist understands exactly what you would like them to do with your hair. If you would like your hair to fall smoothly but not be completely straight, ask your hairstylist to give you a “ blowout with bend .” This will provide body without sacrificing sleekness. This technique works best with hair that is shoulder length or longer. 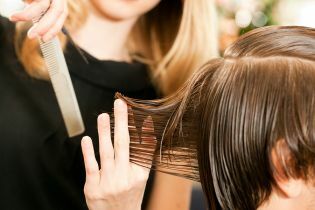 If, on the other hand, you would like completely straight, glossy hair, request a “straight and sleek” cut. Ask the stylist to crop your hair to chin length or longer. Apply a little serum afterward to add gloss. If you would like to achieve a look that involves perfectly formed curls, ask your hairstylist for a “polished” look. This will work well with hair of any length, except very short. For a more relaxed, carefree style with looser, messier curls, request an “undone ponytail.” This works well with many different cuts, provided your hair is long enough to tie back. The look is easiest to achieve with hair which was not freshly washed that day. If you are aiming for an edgier look, with shape and definition, try requesting a “piecey” style. This will work well with many different lengths of hair, but looks most striking on short hair cut into layers. Always discuss your preferred style carefully with your hairstylist before they begin to cut your hair. Using the right terminology can help ensure that you both understand the exact look you are aiming for. Your hairstylist can then give you some advice on how to style and care for the cut of your choice. If you’re planning on wearing a wedding veil on your big day, a stylist at a hair salon near you can help you find the perfect wedding hairstyle in Marlton. Your veil doesn’t have to hide a gorgeous updo or cute bob haircut. 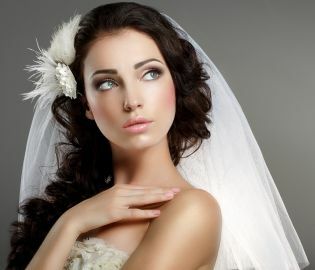 Here are some great wedding hairstyle ideas for brides who plan on wearing wedding veils. Many brides prefer an updo if they plan on wearing a veil. The weight and texture of a veil may feel too heavy when combined with a long or medium hairstyle. Brides may also worry that a veil will get tangled in their hairstyle, or that the veil will mess up their hair if they wear it down. Your hairdresser can style your hair into a chic, elegant updo, like a chignon, a sleek bun, or a soft, braided crown or wreath. Your wedding hairstyle can complement the style of your dress and veil, and your wedding theme, such as romantic, vintage, modern, or classic. A short haircut can still easily be transformed into an exciting wedding hairstyle. Ask your stylist create loose, natural finger waves for a romantic, vintage look. Your stylist can also create a sleek, sophisticated bob haircut, which will look amazing under a shorter wedding veil. Short haircuts and bob haircuts also look cute under cropped, birdcage-style veils that only cover half of the face. You can also ask your hairdresser to roll your hair up in small, loose sections to create spirals. When the spirals are pinned into place with bobby pins, you’ll have beautiful pin curls for your wedding hairstyle. Another option for short haircuts is to get hair extensions at a hair salon near you. Hair extensions look natural and luxurious, and give you the chance to experiment with long, flowing wedding hairstyles. Ask your hairdresser to give you loose, romantic curls, or a long, sleek braid down your back, or wear your hair in a half-up, half-down hairstyle.